We have recently started to work with an interesting additional data-source for Wikipedia data: the number of views per hour a specific Wikipedia page receives. 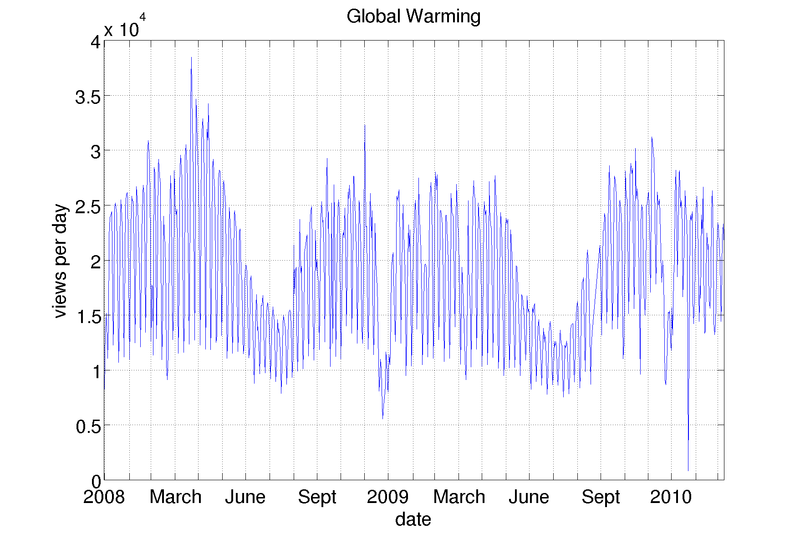 This data is available at this website http://dumps.wikimedia.org/other/pagecounts-raw/ and contains view data since 2008. Below we present three examples of the temporal evolution in the interest a specific Wikipedia article generates. Until now we have extracted and processed view data from 2008 till March 2010, more data is being currently downloaded. Number of daily views to the article Global Warming. One can observe a weekly cycle, seasonal variations and a significant drop of views around Christmas. The article about Climate Change shows similar variations. However the number of daily views is an order of magnitude smaller and shows a significant increase in interest (multiplying the number of daily views by two) starting in the last quarter of 2009. 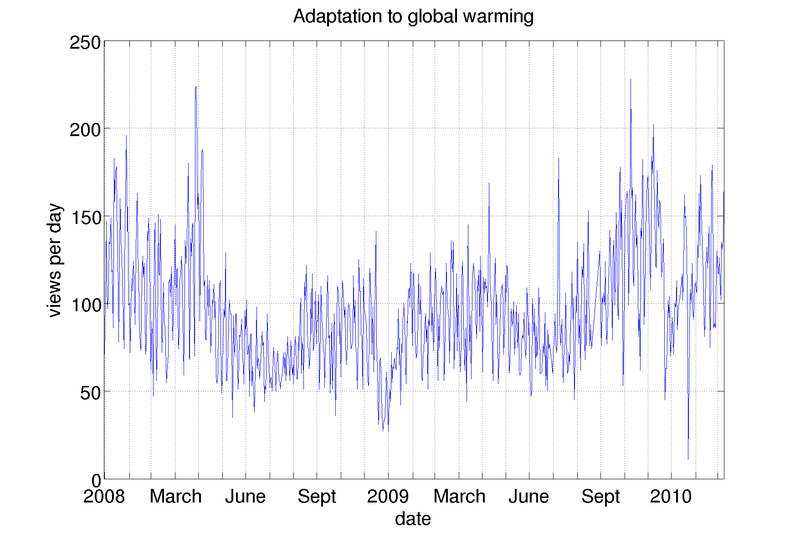 Finally we also add the views to the article about Adaptation to global warming. The number of daily views is much lower than in the two previous examples, but the weekly and seasonal trends appear as well. Interesting applications of this type of data might be the combination with the number of edits or comments per time unit, or adding the view count as additional parameter to the network visualizations (generating snapshots for views in different time windows). This entry was posted by Barcelona Media on Monday, December 10th, 2012 at 12:39 pm. 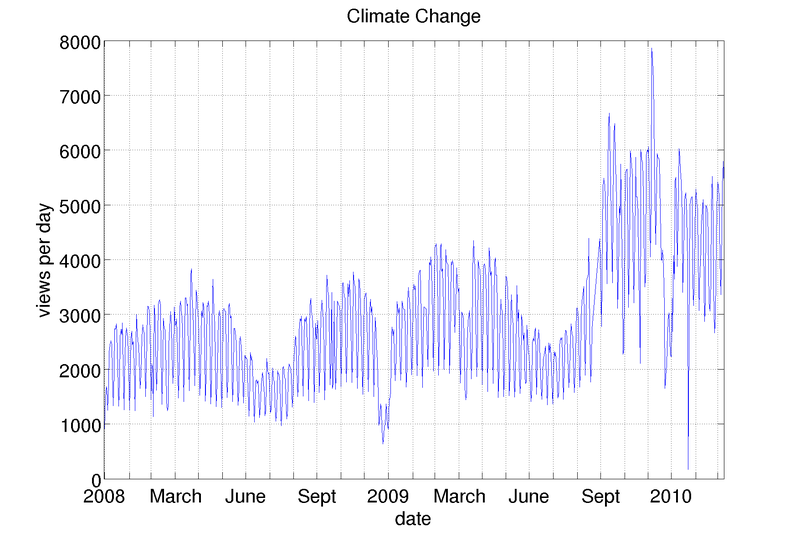 It is filed under climate change, Example. You can follow any responses to this entry through the RSS 2.0 feed. You can leave a response, or trackback from your own site. © 2012 EMAPS | Powered by WordPress | Theme 'Sirup' by 1000ff | 36 queries 0.211 sec.